With such busy schedules we’re all looking for ways to simplify life, especially work. What if we told you we could help with that by simplifying your business IT. Enter cloud solutions by Firefly. What is cloud computing? In the most basic terms, it's storing and accessing data and/or programs over the Internet, rather than a physical, on-site hard drive. Cloud-based solutions are quickly becoming the choice for many businesses, small and large alike. And it’s clear to see why. Not only do they provide the mobility you crave, allowing access to files and programs nearly anywhere in the world, but also save money, resources and increase productivity. 80% of those who migrate to cloud-based services report significant improvements over the first 6 months. 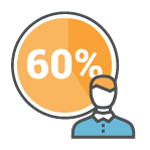 60% of businesses say that the biggest benefit of participating in a cloud-based business network is the enhanced performance they see in specific areas, such as streamlined payroll operations, more accurate supply chain data, etc. 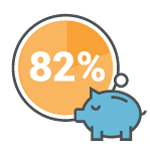 82% of companies say that moving to the cloud has saved them money. while making your business IT easier!